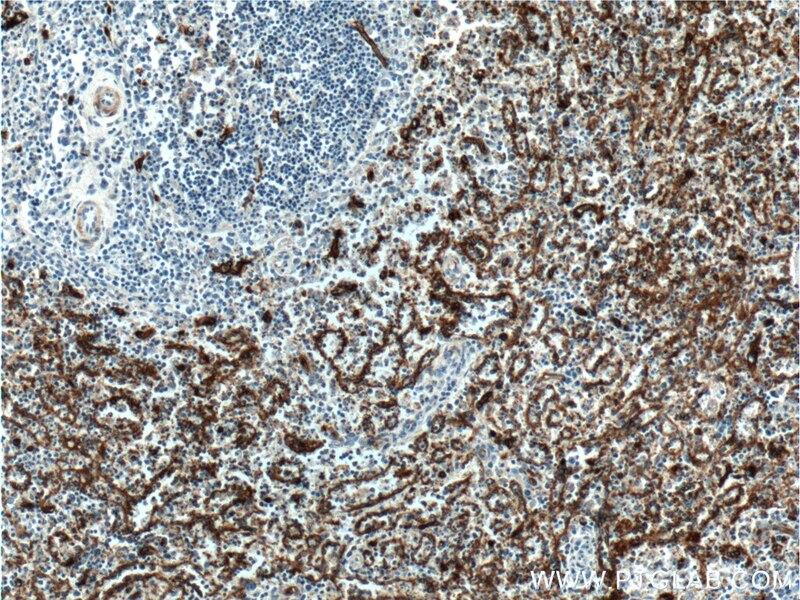 Immunohistochemical analysis of paraffin-embedded human spleen tissue slide using 18836-1-AP( CD36 antibody) at dilution of 1:800 (under 10x lens). 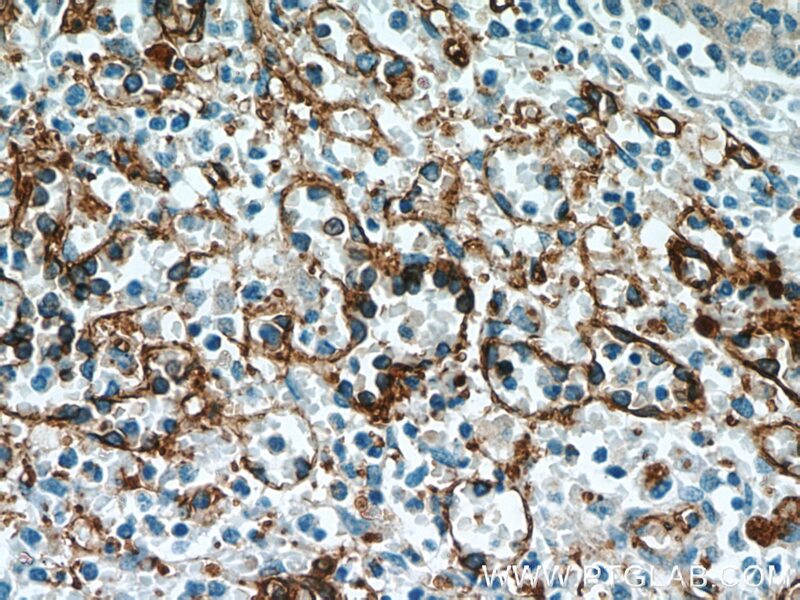 Immunohistochemical analysis of paraffin-embedded human spleen tissue slide using 18836-1-AP( CD36 antibody) at dilution of 1:800 (under 40x lens). 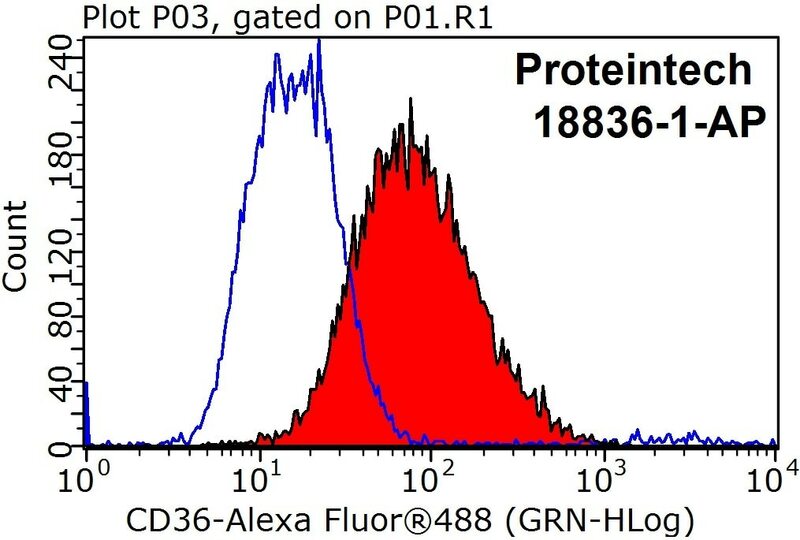 1X10^6 RAW 264.7 cells were stained with 0.2ug CD36 antibody (18836-1-AP, red) and control antibody (blue). Fixed with 90% MeOH blocked with 3% BSA (30 min). Alexa Fluor 488-conjugated AffiniPure Goat Anti-Rabbit IgG(H+L) with dilution 1:1000. CD36, also known as platelet glycoprotein 4, is an integral membrane glycoprotein that acts as a scavenger receptor. CD36 can bind to multiple ligands, including thrombospondin-1, collagen, oxidized phospholipids, oxidized low-density lipoprotein, and long-chain fatty acids. CD36 can also bind to erythrocytes parasitized by Plasmodium falciparum and apoptotic cells. CD36 mediates different biological processes, acting as a signaling hub in angiogenesis, inflammatory response, and fatty acid metabolism. 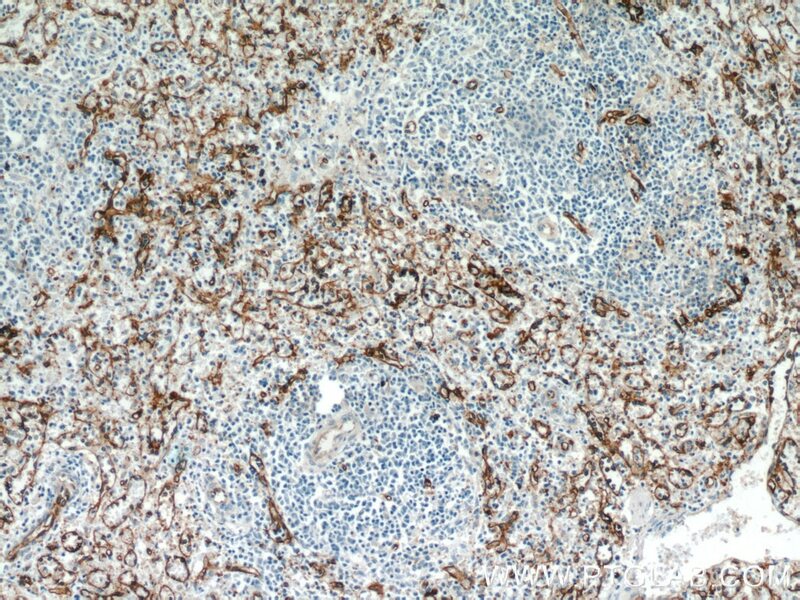 CD36 is present on the surface of various cells types, such as adipocytes, monocytes, macrophages, platelets, microvascular endothelial cells, dendritic cells, and hematopoietic precursors of red cells. Mutations in CD36 can give rise to platelet glycoprotein IV deficiency, a type of macrothrombocytopenia. Polymorphisms in CD36 can increase susceptibility to malaria. AAGIC haplotype at the CD36 locus increases the risk of coronary heart disease. Disruption of CD36-dependent pathways and certain SNPs in the CD36 gene are attributed to impaired fatty acid metabolism, glucose intolerance, Alzheimer’s disease, atherosclerosis, arterial hypertension, diabetes, and cardiomyopathy. Apart from the full-length protein (isoform 1), one additional shorter isoform has been reported (PMID: 7509795). Other alternative isoforms have also been detected on the mRNA level (PMID: 17673938). The extracellular domain of CD36 is extensively glycosylated. Glycosylation is needed for the transport of CD36 to the plasma membrane, as well as mediating recognition and binding to ligands. Cytoplasmic tails of transmembrane domains can be phosphorylated and play a role in signal transduction. Intracellular domains can be additionally acetylated, ubiquitinated, and palmitoylated (PMID: 28919632). 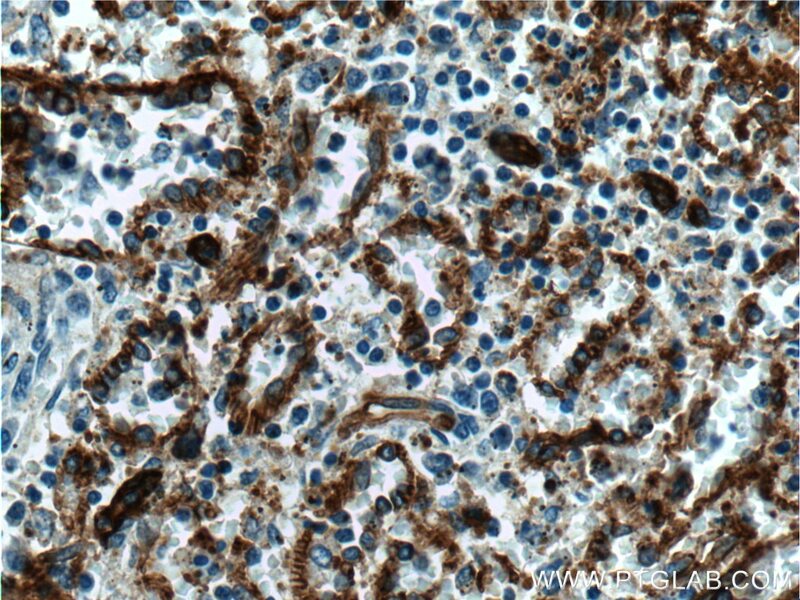 CD36 is present on the cell surface. Cytotoxic Necrotizing Factor 1 Downregulates CD36 Transcription in Macrophages to Induce Inflammation During Acute Urinary Tract Infections. Proatherogenic Flow Increases Endothelial Stiffness via Enhanced CD36-Mediated Uptake of Oxidized Low-Density Lipoproteins. Air pollution is associated with the development of atherosclerosis via the cooperation of CD36 and NLRP3 inflammasome in ApoE-/- mice. Cereal Fiber Ameliorates High-Fat/Cholesterol-Diet-Induced Atherosclerosis by Modulating the NLRP3 Inflammasome Pathway in ApoE-/- Mice. The protein acetylase GCN5L1 modulates hepatic fatty acid oxidation activity via acetylation of the mitochondrial β-oxidation enzyme HADHA. Upregulation of miR-200b Inhibits Hepatocellular Carcinoma Cell Proliferation and Migration by Targeting HMGB3 Protein. 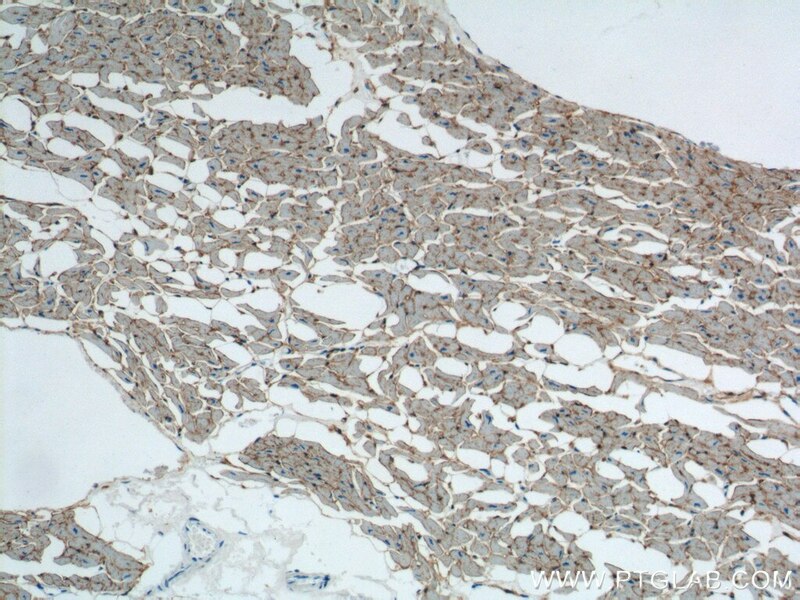 Immunohistochemical analysis of paraffin-embedded human heart tissue slide using 18836-1-AP( CD36 Antibody) at dilution of 1:200 (under 10x lens). 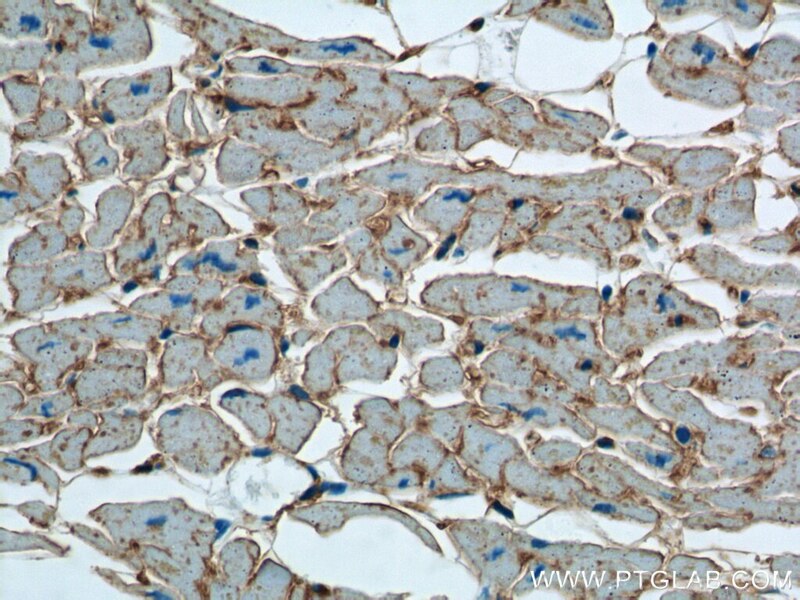 Immunohistochemical analysis of paraffin-embedded human heart tissue slide using 18836-1-AP( CD36 Antibody) at dilution of 1:200 (under 40x lens).